Just like fruits, vegetables are also needed by the body because they are rich in fiber, vitamins and minerals enzymes. 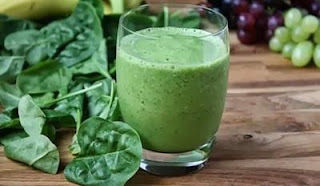 Raw vegetable juice has a higher nutrient content than processed green vegetables. Not only that, the nutrients in processed vegetables in the form of various juices are easier to digest, faster circulated by the blood so that the body does not lack the intake of substances needed for metabolic processes. Raw vegetable juice contains elements of micro minerals such as boron, selenium, and chromium which are needed by the body. These minerals will come out when the food is processed into juice, not cooked instead of boiled. Mineral selenium in green vegetables acts to protect the body from cancer. Boron serves to help calcium absorption in children, adolescents and the elderly. Whereas chromium with insulin is beneficial in the process of carbohydrate metabolism as well as fat, and serves to facilitate the entry of glucose into cells. So, don't underestimate the benefits of green vegetable juice for your health and fitness. Pay attention to the ingredients that you choose to be processed into green juice because not all raw vegetables have good taste according to the Indonesian tongue. The addition of fruit ingredients is also highly recommended for making delicious vegetable juices besides being useful as a natural sweetener. Clean the spinach leaves from the dirt that is still sticking, peel the carrots. Add spinach, carrots, celery to the juice extractor. Process until the juice comes out, pour it into the glass. Add sugar syrup or honey, mix well and serve immediately. Broccoli and apples are washed thoroughly, oranges are peeled. Put all ingredients into the juice extractor. The process until the juice comes out, hold it in a glass and serve. The benefit of this vegetable juice recipe is to cleanse poisons that are buried in the body (detox). After being washed, yam and cucumber are peeled and cut into pieces. Put it in a blender, add yogurt and sugar syrup. Process using a blender until smooth and evenly mixed. Pour into a glass, serve immediately. Cucumber vegetable juice is very good for treating beauty from within by helping the skin regeneration process and nourishing the skin to make it healthier. Apples, tangerines and radishes are washed and then peeled the skin and then juice until it breaks. Mash celery vegetables, squeeze and then take the water. Mix the juice with celery juice then add the sugar syrup, mix well. This green vegetable juice recipe is useful for people with hypertension, coronary heart disease, preventing colon cancer, promoting digestion, lowering cholesterol and very good for maintaining the health of pregnant women. Peel the cucumber and cut it into pieces so that it is easily broken. Divide the lime in half then squeeze the water. Blend the cucumber until smooth, strain. Mix cucumber juice with orange juice, ginger water and sugar syrup. The process returns using a blender until it is evenly mixed. Pour into a glass, serve. To be fresher, serve by adding ice cubes on top of it. This green vegetable juice recipe made from cucumber is useful for treating beauty, keeping skin smooth and tight from the inside thanks to its natural vitamins and nutrients.